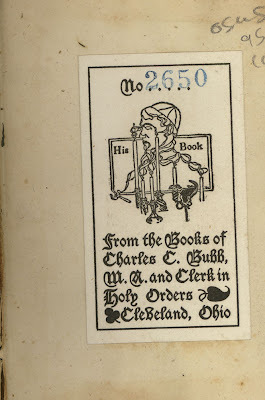 Bookplates can create wonderful associations to their former owners. For a lover of ephemera the bookplate of Bella C. Landauer, drawn by Sidney Hunt in 1925, is a treasure. This imposing art deco gem is very confident in its place on the front paste-down of Hansard’s Typographia (London, 1825). 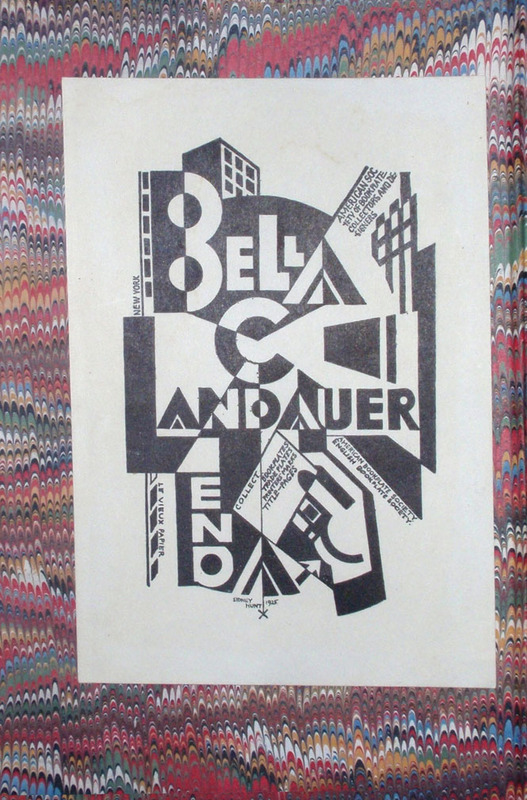 The story goes that Landauer (1874–1960) bought a scrapbook full of bookplates from an impoverished student, only to discover the book had been stolen. 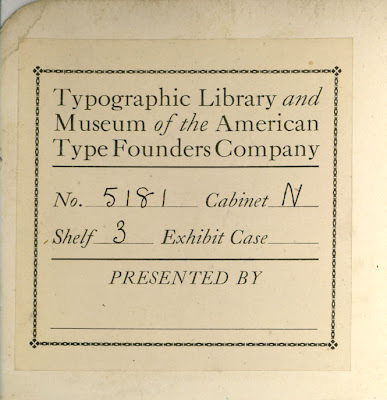 Nevertheless she caught the ephemera collecting bug and she went on to build a vast collection of printed matter, partly housed at the New York Historical Society Library. In addition to the 800,000 items there, she donated other collections to the Met, the Smithsonian, NYPL, Library of Congress, Harvard — and still had enough paper left over to leave to other institutions. John C. Tarr (1894–1976), calligrapher and type designer, was the author of Good Handwriting and Printing Today. 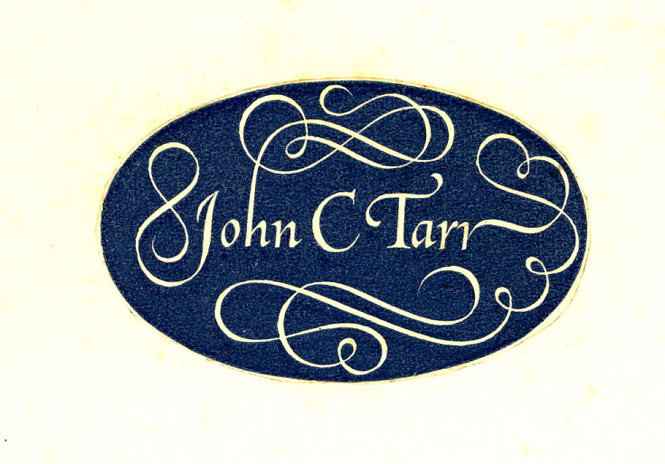 Tarr was a draughtsman at the Monotype Drawing Office in London alongside Victor Lardent. 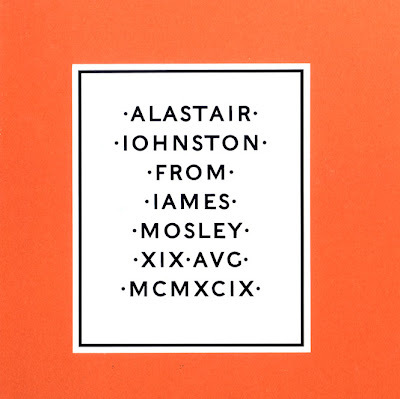 He worked on some of the notable types of Stanley Morison including Times Roman. Due to weak lungs he moved to Morocco, then Berkeley, California where he died. Having known him, and got the inside gen on Morison, I was pleased to find some volumes from his library at Moe's Books in Berkeley. 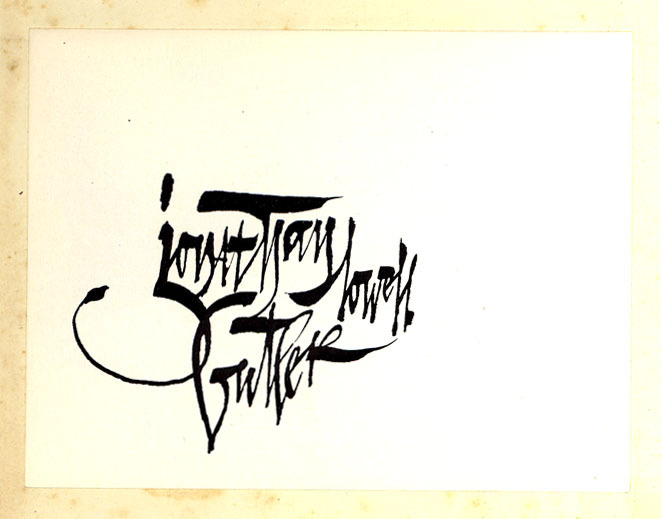 A conservative Arts & Crafts design was produced by calligrapher William Brooke for his plate (found in Caractères de l’Ecriture by Stanley Morison, Paris, 1927). A typographic approach from the same era is seen in the work of the Rev. Charles Clinch Bubb (1876–1936). 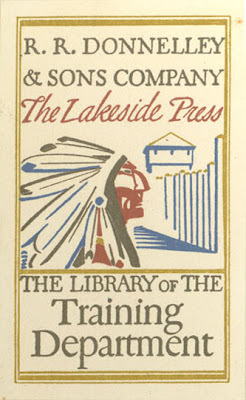 He ran a private press in Cleveland, Ohio from 1905 to 1931, called the Clerk’s Press, so he probably designed and printed this bookplate (in Figgins’ Caxton type) himself. 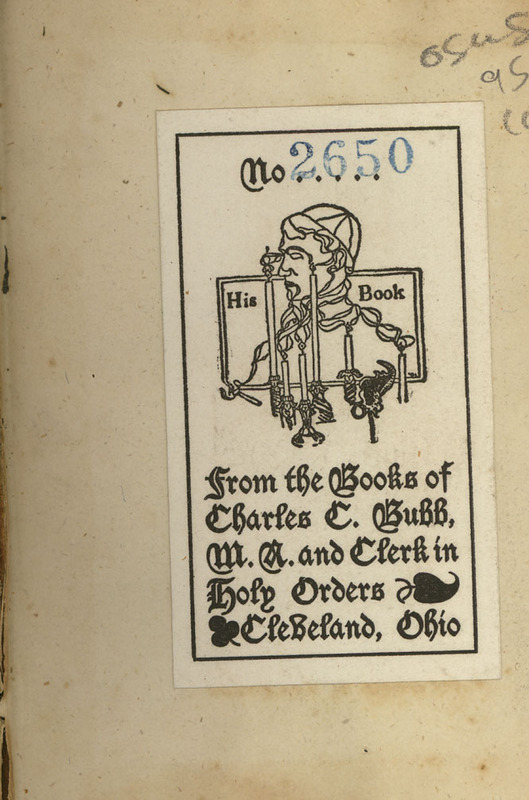 He corresponded with T. Bird Mosher and Richard Aldington, and printed a lot for the Rowfant Club of Cleveland. 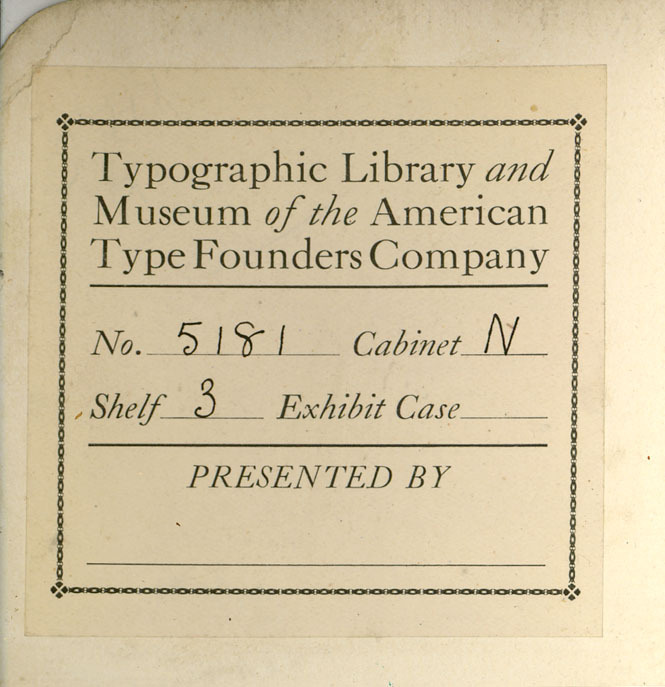 A grail for scholars of typography is the Library of the American Type Founders Company, now housed at Columbia University in New York. In 1934, the librarian, Henry L. Bullen, had the notion to sell off duplicates from the collection. We (the Poltroon Press library) have two of them. 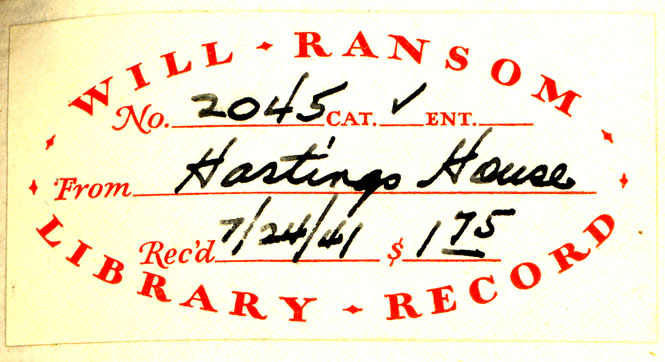 This label (printed in ATF Caslon 540) is in the 1888 Benton-Waldo Portable Book of Specimens, which Bullen sold originally for $3.50. 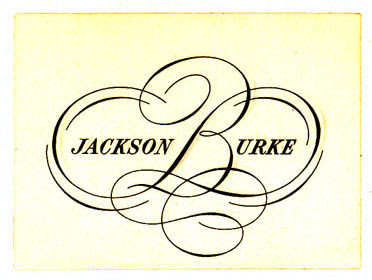 Jackson Burke (1908–75) was Director of Typography at Linotype, where he designed the typeface Trade Gothic. 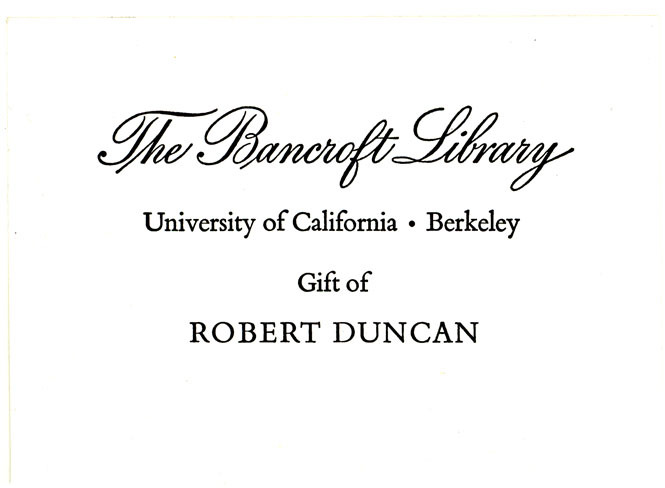 In 1975, Dawson’s Books of Los Angeles put out a 3-volume catalogue of his library that included many treasures including a copy of Moxon’s Mechanick Exercises (1683) that was purchased by San Francisco Public Library. Though not on the level of the ATF Duplicate Catalogue, Dawson’s set is still a valuable reference work. 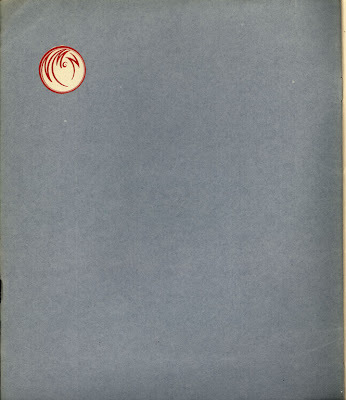 From it, we acquired Copy & Print in the Netherlands by Wytze Hellinga (Amsterdam, 1962) for our library. When I say “we” I should perhaps introduce my partner in Poltroon Press, Frances Butler, who has worn many hats, including that of textile artist, book artist, illustrator, scholar and calligrapher. Since she retired from academia to rural France it is often said of her that she is out standing in her field. Her husband, Jonathan Lowell Butler (1939–74), was a Romance Philologist who taught at UC Berkeley in the 1960s and 70s. 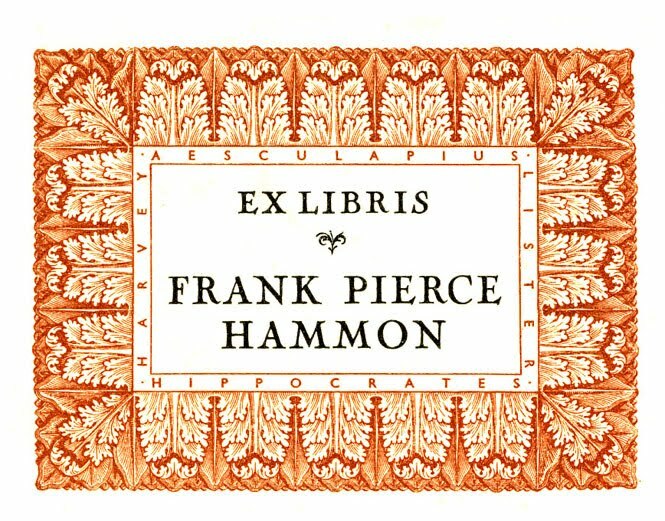 His bookplate was calligraphed by Frances & printed letterpress. Peregrine Press was the San Francisco press of printmaker Henry Evans (1918–90). Publisher of poets Robert Creeley and Robert Duncan, he was busted for selling Tropic of Cancer. A nice multiple-association copy as this two-volume set of John Johnson’s Typographia (1824) also has the signature of printer and publisher Roger Levenson (1914–94). Hand-trimmed bookplate in Caslon 471 type. 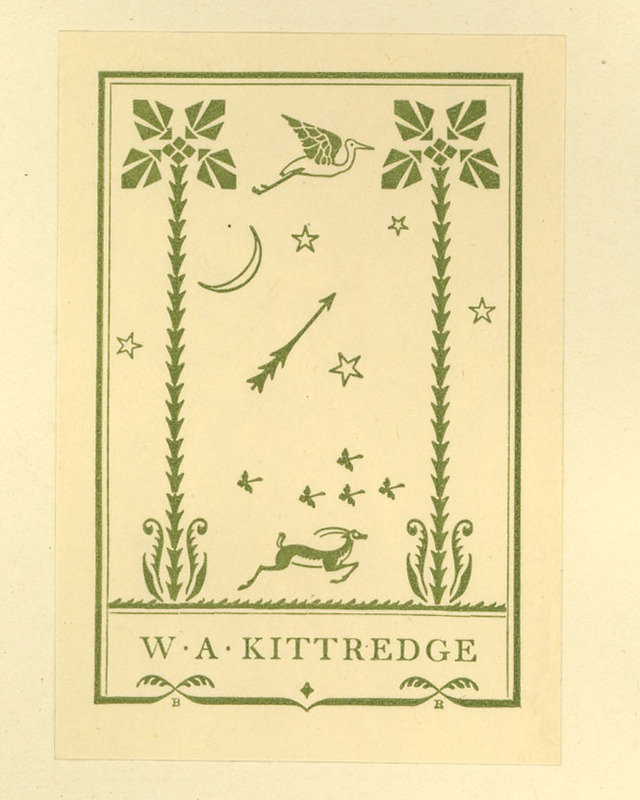 William Albion Kittredge’s (1891–1945) bookplate was designed by Bruce Rogers. 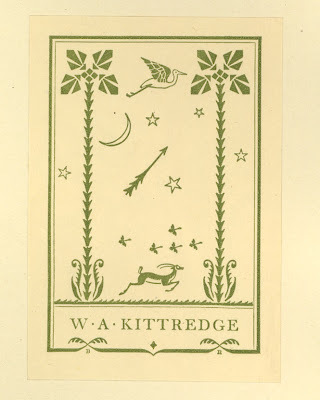 Kittredge worked as a designer at the Lakeside Press in Chicago and worked with Rockwell Kent, Grant Wood, Thomas Hart Benton and Frank Lloyd Wright. Bruce Rogers was one of the most playful typographers in America, as this bookplate demonstrates. However he designed on paper, preferring to let others handle the kerning and rule mitring which he desired. 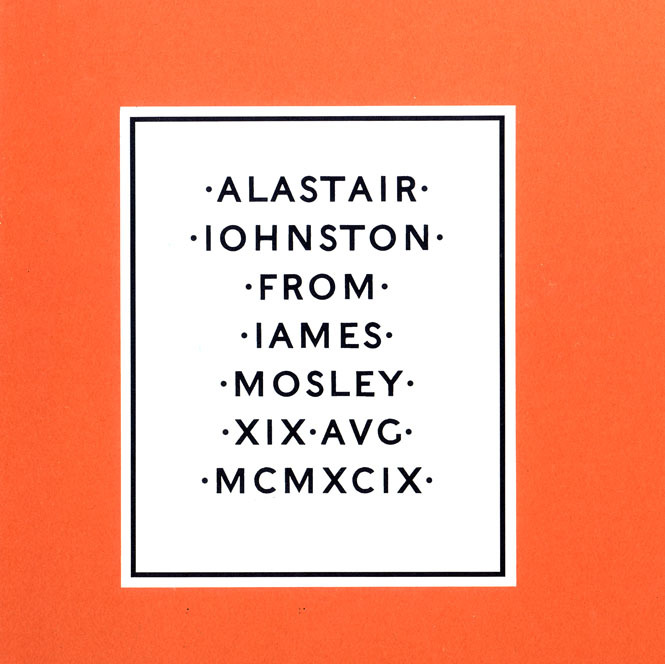 The type is Monotype Bell; the bookplate is in a British Museum catalogue from 1929 that is the first trial showing of Monotype Bembo. R. R. Donnelley & Sons' Training Department bookplate is one of two different ones we have. 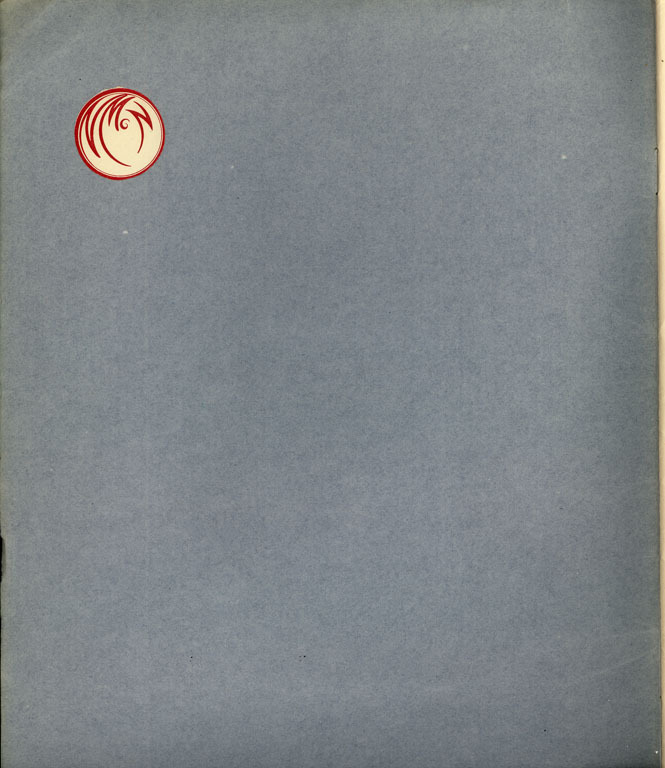 This one was designed by the master W. A. Dwiggins. I wonder how many young apprentices in the Lakeside Press building in Chicago’s Printer’s Row were inspired by their lunch-time browsing of this technical manual from 1910. 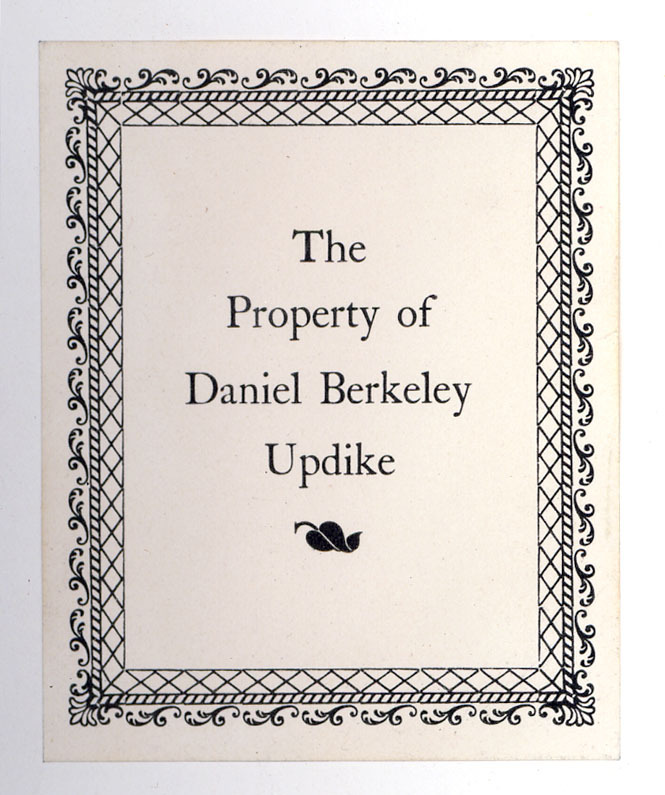 I wrote earlier about Dwiggins' pochoir or stencil-work, and the Lakeside Press bookplate has that look about it. Another pleasing find was the stenciled bookplate of S. A. Godfrey’s Circulating Library of Marylebone, London, in a well-worn copy of a Victorian set of Dickens’ novels. 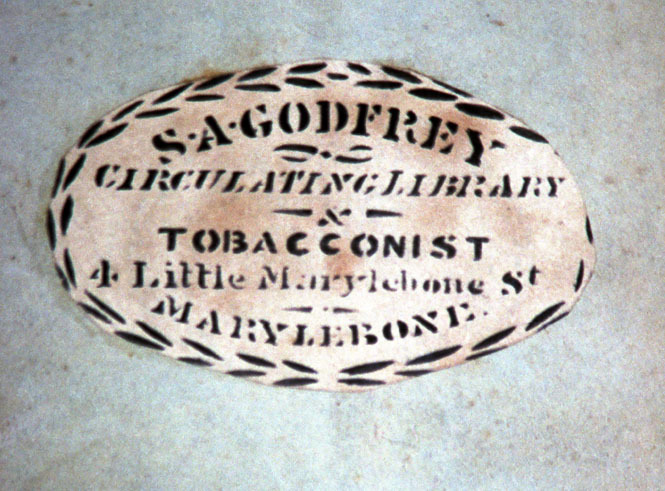 Godfrey was also a tobacconist so his clients probably popped in regularly to check out a book and buy smokes. As a youngster, Thomas Maitland Cleland (1880–1964) became a printer and moved to Boston where he came under the influence of D. B. Updike. He worked as a commercial artist and illustrated fine press books for the Limited Editions Club and others by means of pochoir using thin metal plates which he cut himself. 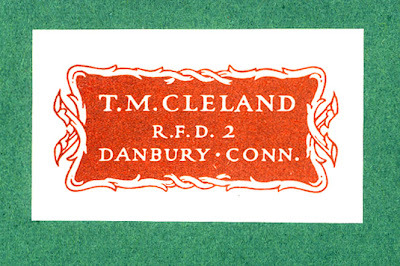 His white lettering on a red background is particularly striking on green endpapers. I found the bookplate of Will Ransom (1878–1955), American book designer, author and historian (and creator of the evil Parsons typeface), in the back of a vellum-bound pamphlet, Of Typecasting in the Sixteenth Century, printed for members of the Columbiad Club by Carl P. Rollins at Yale in 1941. Ransom lists where he got it, and how much he paid. 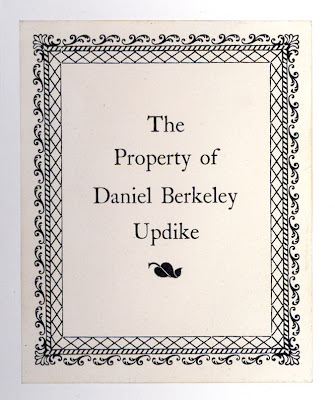 Daniel Berkeley Updike (1860–1941), the distinguished American scholar-printer, came from an old Rhode Island family. He worked at the Riverside Press division of Houghton Mifflin and set up on his own as a typographer at the Merrymount Press in 1896. 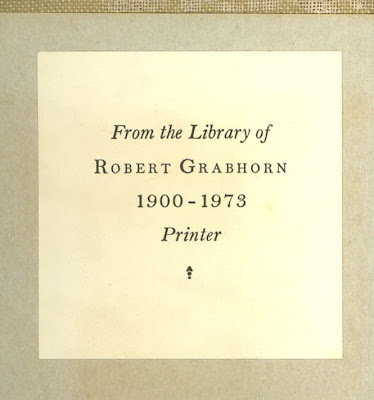 A series of lectures he gave at Harvard Business School turned into his two-volume work Printing Types, published in 1922. 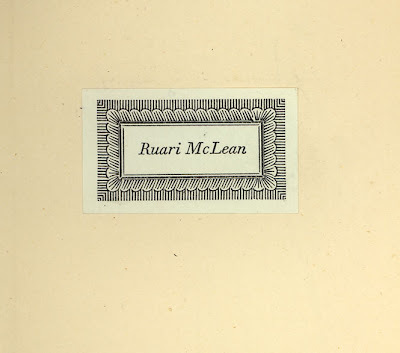 His library went to the Huntington Library in Southern California, so it is remarkable to find his bookplate in a book given to him by his colleague Stanley Morison. 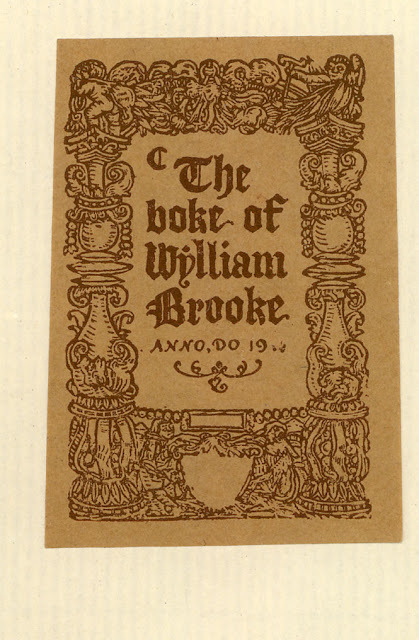 His bookplate is in Janson. The Robert Grabhorn (1900–73) bookplate in Bell type was printed by Roger Levenson (from the look of it) and added to his books posthumously (as his appended dates attest). After his death, his library went to the San Francisco Public Library where it forms the basis of their collection on the history of printing. 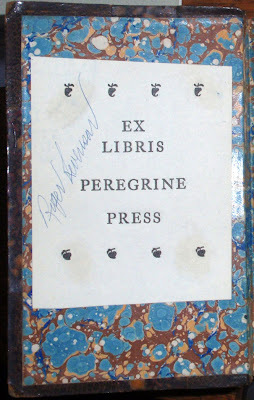 So a stray book with his bookplate is a rarity, unless it was stolen from SFPL, which mine was not. It occurs in a copy of Richard Freeman’s Graffiti (Hutchinson, 1966) and includes a charming inscription from Grabhorn’s young niece (now a lawyer in Los Angeles): “Kilroy was here [peace sign] Merry Xmas Uncle Bob Love Vicky.” The Library or family must have discarded it. 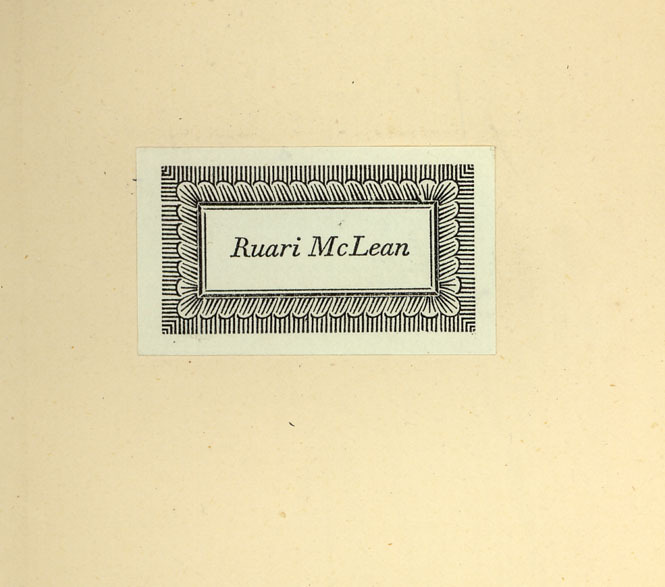 Scottish designer and historian Ruari McLean (1917–2006) had a bookplate in Walbaum italic. 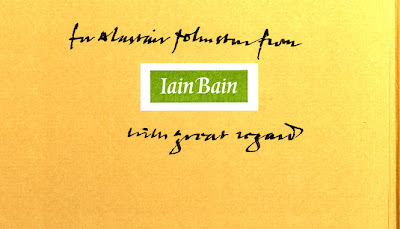 The border hints at the Victorian excess he documented in his many books, but he was also a champion of Jan Tschichold’s modernist design aesthetics. I was thrilled to discover his plate in a rare book I had long sought, J. Millington’s Are We to Read Backwards? published by Andrew Tuer at the Leadenhall Press in London in 1884. In the Watergate era Berkeley bookseller Peter Howard asked me to make a large bookplate he could use to cover up unsightly ones in books he had for sale. I came up with the ﬁctitious character P. Howard Hunt. I must have a copy somewhere; it was pretty plain, in Palatino capitals, as I recall. I have printed many bookplates, all of them designed by others. 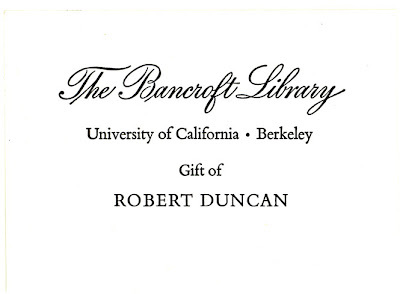 Thousands of books given to the University of California’s Bancroft Library by the Hearst family and poet Robert Duncan (in Bembo) have an example of my printing in them, executed while I was an apprentice at Arif Press in Berkeley. 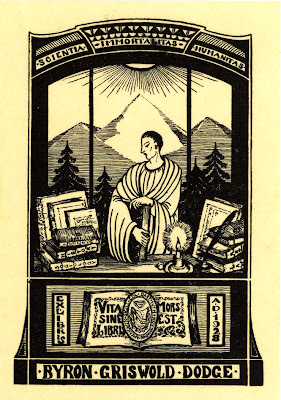 A favorite early job was the large bookplate for Sam Bercholz, co-founder of Shambhala Books in Berkeley in 1974. 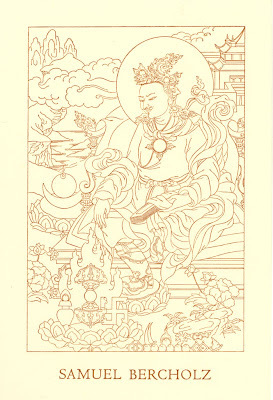 Shambhala became the leading publisher of Buddhist texts in the West. 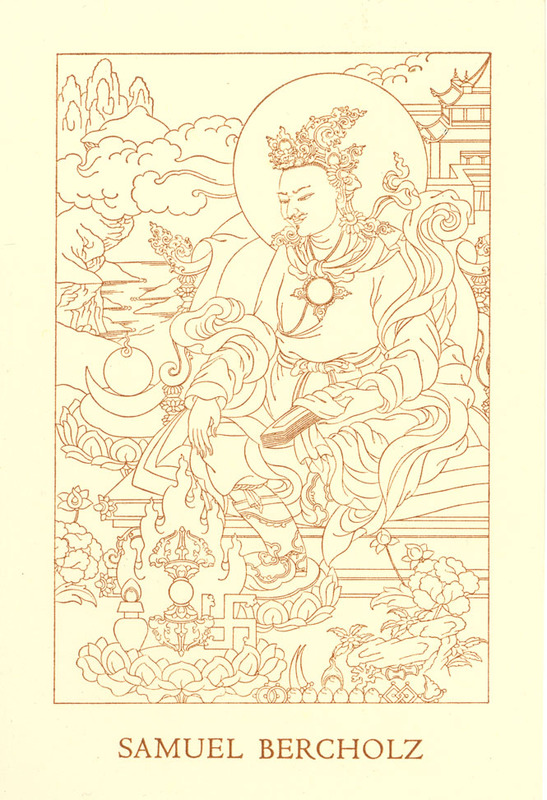 The art for Sam’s bookplate was done by Glen Eddy (1941–2006), a Californian who became adept at the Tibetan thanka style of Tikse, or proportional drawing. The typeface is Centaur. Byron Griswold Dodge was clearly ahead of his time. 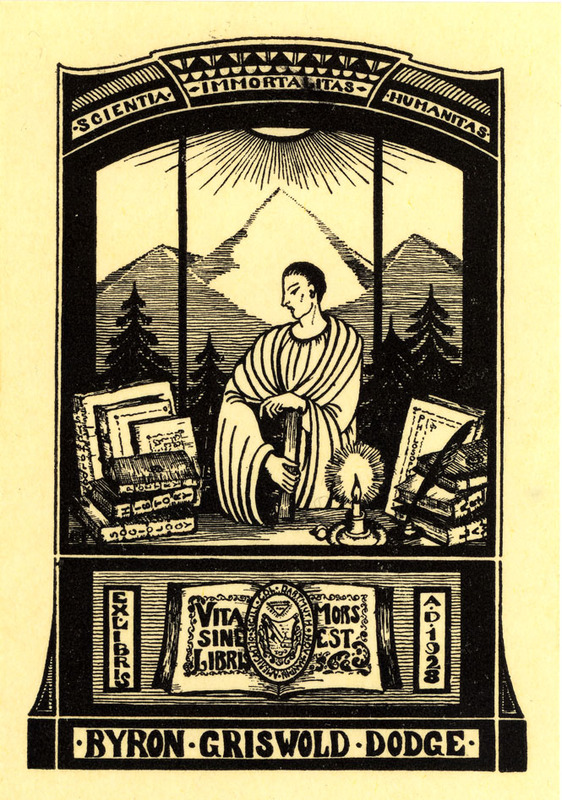 His woodcut “New Age” bookplate, printed by Taylor & Taylor of San Francisco, dates from 1928. But Californians have always been interested in spiritual matters. Another Taylor & Taylor production is Frank Pierce Hammon’s neat bookplate in Nicolas Cochin and Gill Sans types and some richly colored border ornaments (Caslon's 5-line pica No 15 from their 1895 catalogue). 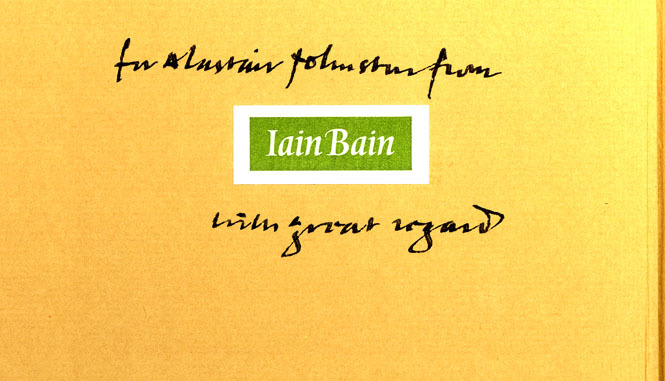 Another treasured book, Thomas Bewick’s Memoir of my Life (Oxford University Press, 1975), was given to me by the editor Iain Bain, who inscribed it around his own bookplate. Lawyer Alfred Sutro (1869–1945) was president of the Book of Club of California. His ostentatious bookplate is gold-foil embossed on blue leather. 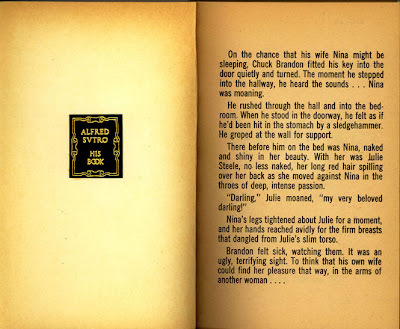 There’s a lesson for bibliophiles here: After his death someone found a collection of his bookplates and one of these was stuck into a lurid paperback called Deviate Wives which I now own. 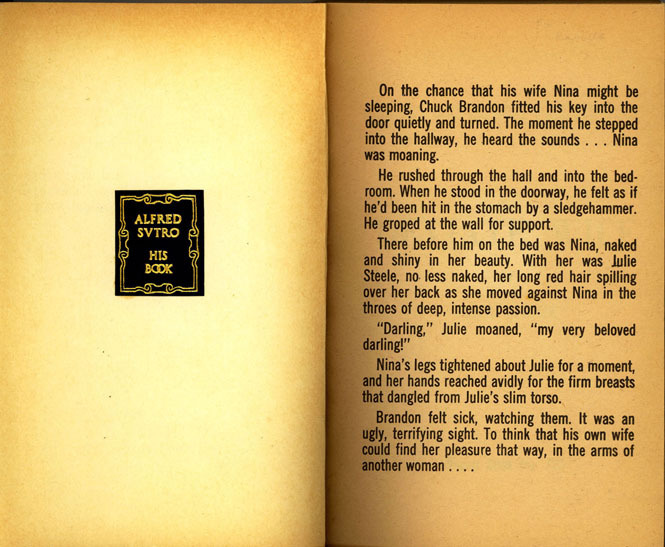 Deviate Wives with Sutro bookplate. I always considered bookplates a rather dull subject until I read this beautifully annotated catalogue. Mr. Johnson wisely has associated the bookplates with the books s well as the history behind them. It makes fascinating reading. Thanks so much for widening my horizons.